Approximately five thousand years ago in the Himalayas, one of the greatest sages of India, Srila Vyasadeva wrote down the Vedas which included Ayurveda or "The Science of Life". "Ayur" means "Life" and "Veda" means "Science". As with all holistic medical systems it is based on a premise of balance creating good health. Srila Vyasadev entrusted the original copies of the texts with his most erudite and enlightened disciples, who, along with other great sages, inaugurated a very long sacrificial ceremony for hundreds of years for the purification and blessings of the entire world. Disciples studied and discussed these ancient texts as the knowledge was passed down through the centuries expanding and developing these original and eternal truths without ever altering them. 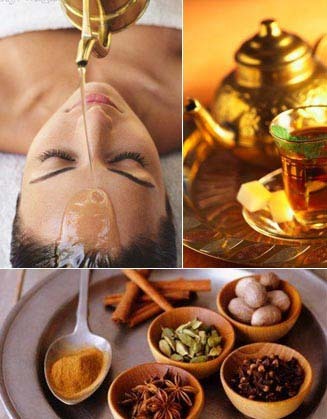 The notion that Ayurveda is of divine origin is shared by many Ayurvedaic personalities. That the knowledge of medical sciences come from the gods is a common belief in other civilizations as well. 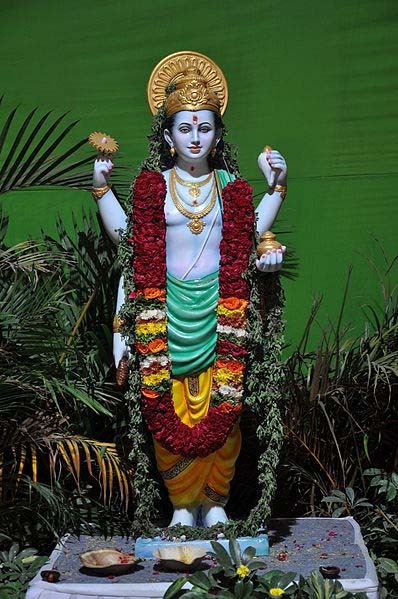 Thoth and Apollo were thought to have given medical practices to the ancient Egyptians and Greeks, while in India, it is said that Lord Brahma is the originator of Ayurveda. The cause of disease in Ayurveda is viewed as the lack of proper cellular function because of an excess or deficiency of Vata, Pitta or Kapha and/or the presence of toxins. Body, mind and consciousness must work together in maintaining balance. They are simply viewed as different facets of one's being. To learn how to balance the body, mind and consciousness then requires an understanding how vata, pitta and kapha work together. According to Ayurvedic philosophy the entire cosmos is an interplay of the energies of the five great elements - Space, Air, Fire, Water and Earth. Vata, pitta and kapha are combinations and permutations of these five elements that manifest as patterns present in all creation. Vata types have variable appetite and digestion. They are often attracted to astringent foods like salad and vegetables, but their constitution is balanced by sweet, sour and salty tastes. Vata people tend to produce little urine and their feces are hard, dry and small in size and quantity. Mentally, vata people usually grasp things quickly but then forget them quickly. They are alert, restless and very active. They walk, talk and think fast, but are easily fatigued. They have less willpower and often feel unstable and ungrounded. They have less tolerance, confidence and boldness. When unbalanced, vata types have a tendency to become fearful and nervous, and may experience high anxiety. In the external world, vata types tend to earn money quickly and spend it quickly. They are not good planners and as a consequence may suffer economic hardship. Vata resides in the colon, as well as the brain, ears, bones, joints, skin and thighs. Vata people are more susceptible to diseases involving the air principle, such as emphysema, pneumonia and arthritis. Other common vata disorders include flatulence, tics, twitches, aching joints, dry skin and hair, nerve disorders, constipation, and mental confusion. Vata tends to increase with age as is indicated by drying and wrinkling of the skin. Since the attributes of vata are dry, light, cold, rough, subtle, mobile, clear and dispersing, any of these qualities in excess can cause imbalance. Frantic travel, especially by plane, loud noises, continual stimulation, drugs, sugar, and alcohol all derange vata, as does exposure to cold and cold foods. Like the wind, vata types have a hard time becoming and staying grounded. Routine is difficult but essential if vata is to be lowered and controlled. In general, people with excessive vata respond most rapidly to warm, moist, slightly oily, heavy foods. Steam baths, humidifiers, and moisture in general are helpful. As you continue to improve your eating habits, your body will begin to naturally detoxify itself. You can help boost your body's natural detoxification processes by stimulating digestion with an herbal fiber supplement. When combined with digestive herbs and psyllium husk, fiber supplements also make a great colon cleanse for detoxification. Pitta people have many of the qualities of fire. Fire is hot, penetrating, sharp, and agitating. Similarly, pitta people have warm bodies, penetrating ideas, and sharp intelligence. But they can also become very agitated and short tempered. The pitta body type is one of medium height and build, with ruddy or coppery skin. They may have many moles and freckles. Their skin is warm and less wrinkled than vata skin. Their hair tends to be silky and they often experience premature graying or hair loss. Their eyes are of medium size and conjunctiva is moist. The nose is sharp and the tip tends to be reddish. Pitta people have a strong metabolism, good digestion, and strong appetites. They like plenty of food and liquids. They tend to love hot spices and cold drinks. However, their constitution is balanced by sweet, bitter and astringent tastes. Pitta people sleep well and of medium duration. They produce large quantities of urine and feces, which tend to be yellowish, soft and plentiful. They easily perspire. Hands and feet stay warm. Pitta people have a lower tolerance for sunlight, heat or hard physical work. Mentally, pitta types are alert and intelligent and have good powers of comprehension. However, they are easily agitated and aggressive and tend toward hate, anger and jealousy when imbalanced. In the external world, pitta people like to be leaders and planners and seek material prosperity. They like to exhibit their wealth and possessions. Pitta people tend to have diseases involving the fire principle such as fevers, inflammatory diseases and jaundice. Common symptoms include skin rashes, burning sensation, ulceration, fever, inflammations or irritations such as conjunctivitis, colitis, or sore throats. Kapha is formed from Earth and Water and is the energy that forms the body's structure--bones, muscles, tendons--and provides the "glue" that holds the cells together. Kapha supplies the water for all bodily parts and systems. It lubricates joints, moisturizes the skin, and maintains immunity. In balance, kapha is expressed as love, calmness and forgiveness. Out of balance, it leads to attachment, greed and envy. Kapha people are blessed with strength, endurance and stamina. They have sweet, loving dispositions and are stable and grounded. Their skin is oily and smooth. Physically, kapha people tend to gain weight and have a slow metabolism. They shun exercise. They have thick skin and their bodies and muscles are well developed. Their eyes are large, dark, and attractive with thick, long lashes and brows. Kapha people evacuate slowly and feces tend to be soft, pale and oily. Perspiration is moderate. Sleep is deep and prolonged. Kapha types are attracted to sweet, salty and oily foods, but their constitutions are most balanced by bitter, astringent and pungent tastes. Psychologically, kapha people tend to be calm, tolerant and forgiving. However, they may become lethargic. While they may be slow to comprehend, their long term memory is excellent. When out of balance, kaphas tend to experience greed, envy, attachment and possessiveness. In the external world, kapha tendencies toward groundedness, stability, and attachment help them to earn and hold onto money. They tend to have diseases connected to the water principle such as flu, sinus congestion, and other diseases involving mucous. Sluggishness, excess weight, diabetes, water retention, and headaches are also common. Kapha can become more aggravated as the moon gets full because, as biologists have discovered, there is a tendency for water retention at that time. Winter is the time of greatest kapha accumulation and following the dietary and lifestyle changes are most important during that season. 40-50% fresh vegetables with an optional 10% for fresh or dried fruits. A daily salad is good. 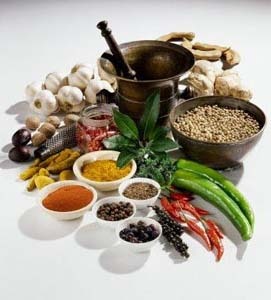 Ayurveda encompasses various techniques for assessing health. It assesses prodromal symptoms, cardinal signs and symptoms, and one's suitability for treatment to help determine the etiology and pathogenesis of an imbalance. Various methods are utilized to help acquire information during an assessment with a client. These methods include: questioning, observation, palpation, direct perception and inference. Techniques such as taking the pulse; observing the tongue, eyes and physical form; and listening to the tone of the voice are employed during an assessment. Palliative and cleansing measures, if appropriate, can be used to help eliminate an imbalance along with suggestions for eliminating or managing the causes of the imbalance. Recommendations may include: implementation of lifestyle changes; starting and maintaining a suggested diet; and the use of herbs. In some cases, participating in a cleansing program, called panchakarma, is suggested to help the body rid itself of accumulated toxins so it can gain more benefit from various suggested measures of treatment. 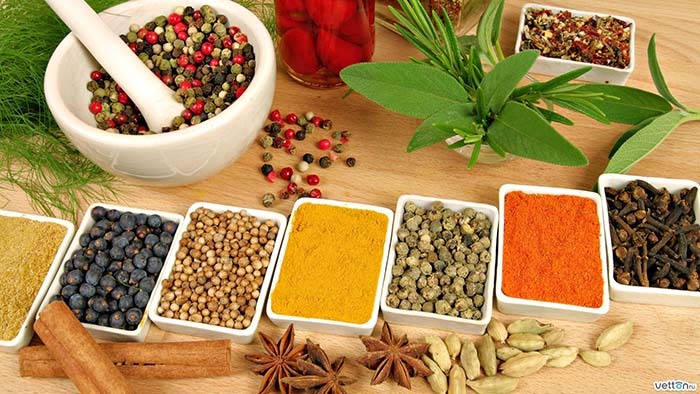 In summary, Ayurveda addresses all aspects of life--the body, mind and spirit. It recognizes that each of us is unique, each responds differently to the many aspects of life, each possesses different strengths and weaknesses. 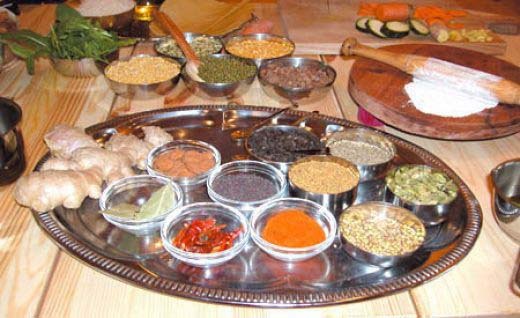 Through insight, understanding and experience Ayurveda presents a vast database of the relationships between causes and their affects, both immediate and subtle, for each unique individual. Amalaki - is used to rebuild and maintain new tissues and increases red blood cell count. It is considered helpful in cleansing the mouth, strengthening teeth, nourishing the bones and is the highest natural source of vitamin C. It reduces pitta without aggravating vata or kapha. Ashwaghandha - has been traditionally used for general debility, sexual debility and nerve exhaustion. It also is said to generate the hormonal system, promote healing of tissues, and support sound sleep. It is very balancing for high vata conditions. Bala - is commonly used for heart disease, arthritic pain, and helpful in soothing inflamed nerve tissue. Bala pacifies high vata-pitta conditions. Bibitaki - has been used as a strong laxative to cleanse the bowels. It is also used as a gargle for sore throats because of its heating and soothing properties. It is a powerful tonic for kapha. Brahmi has been traditionally used for nervous disorders, epilepsy, senility, premature aging, hair loss, obstinate skin conditions and venereal diseases. It pacifies high vata or pitta. Bringaraj is considered helpful in premature graying of hair, balding , alopecia, loss of teeth, enlargement of liver or spleen, chronic hepatitis, anemia and skin diseases. It is a rejuvenative for pitta. Guduchi is a considered a bitter tonic. It is regarded as a blood purifier and stimulant. It is considered helpful in eye disorders and promotes mental clarity. It balances high pitta conditions. Haritaki - is used for coughs, asthma, abdominal distention, tumors and itching. It is a rejuvenative for vata. Manjistha - is considered one of the best blood purifying herbs in Ayurveda. It is said to cool and detoxify the blood, dissolve obstructions in blood flow, and clear stagnant blood from the system. It clears high pitta from the system. Neem is considered one of the best healing and disinfectant agents for skin diseases and anti-inflamatory for joint and muscle pain. It balances high pitta conditions. Shardunikha is commonly referred to as "Gurmar, the destroyer of sugar". It is traditionally used to control blood sugar levels in the body. Shitawari is traditionally used to support the female organs, prevent sexual debility, help menopausal conditions, stomach ulcers, and chronic fevers. It is a rejuvenative for pitta. Hingwastika is traditionally used in supporting digestion, reducing abdominal distension and flatulence and in controlling candida. It balances vata and kapha. Trifala is said to promote normal appetite, good digestion, increase red blood cells and hemoglobin and aid in the removal of undesirable fat. It is a balanced formulation good for all doshas. Trikatu is used as a digestive tonic and to clear the body of toxic material. It clears excess kapha from the system. Yograj Guggulu is said to be useful for reducing joint pain, reducing cholesterol and excess fat from the system. It clears toxins and excess kapha from the body. Digest Ease is a digestion formula for pitta. It supports proper digestion and absorption for individuals prone to hyperacity and heartburn. Digestive Fire can aid in increasing appetite, promoting digestion and burning up excess toxins in the body. Geriforte a proven rejuvenating tonic that slows down ageing. JointCare helps to reduce morning stffness and joint pain. Also considered helpful for relieving pain due to sports strains and sprains. LeanCare a unique herbal formula that regulates lipid metabolism and aids in weight reduction and contol of body fat. LiverCare is a potent liver protection formula that acts against toxins from food, water, alcohol or pollution. Liv.52 improves the functional efficiency of the liver and regulates levels of enzymes and optomizes assimilation. Mentat enhances learning ability and attention span. A natural and safe calming product. Prana/Breath of Life warms and energizes respiration and circulation and helps dispel excess cold and mucous in the system. Rumalaya supports healthy joints, promotes circulation and maintains freedom of movement. Septilin helps increase production of white blood cells and stimulates the immune function to cope with common allergens. Shakti/Energy Tonic renews vital energy to strengthen mental and physical functions and maintain immunity against disease. StressEase is a balancing formula for coping with stress and fatigue. It helps to deal with the mental strains of daily life. SweetEase promotes healthy glucose levels. It may be useful for individuals prone to obesity, or related conditions of high blood sugar or high cholesterol. Tentex Forte is a non-hormonal stimulant that tones up the male system and improves vitality and stamina. TranquilMind promotes relaxation and sleep. It also alleviates nervous tension or anxiety due to stress. Triphalax is a bowel tonic that strengthens the colon and supports proper assimulation of nutrients. UriCare helps to clear impurities from the urinary tract and maintain efficient kidney and urinary system function. Wisdom/Mind Force supports creativity by increasing mental energy without causing restlessness or difficulty sleeping.